After all the planning and waiting it’s finally time for me to reveal my polish collaboration with Blue Eyed Girl Lacquer for the “Teal All the Things” edition of The Color Box. The Color Box is the brain child of Manna of Manna’s Manis and blossomed into a quarterly collaboration between five indie polish makers who are teamed up with five bloggers to create five nail polishes that fit into a color theme. Last quarter we had the inaugural edition of The Color Box that released five gorgeous purple polishes. I have to say, you are in for a treat with the teal edition as well. If you aren’t familiar with Blue Eyed Girl lacquer I did an interview with Julie, the maker and owner. You can check out that interview here. The inspiration behind our polish was Derek Zoolander’s merman commercial from the first film. There’s been a bunch of mermaid polishes in various teal shades but we wanted to do something different and that had a sense of humor to it. After all, polish is supposed to be fun. Because if it’s not fun then why bother, right? Anyways, if you’re not familiar wih the scene I am referencing from Zoolander you can view it below. The name of our polish is “Merman, Pops, MerMAN” Even though Zoolander actually coughs in that quote we decided to alter the quote a bit in homage to the scene. Merman, Pops, MerMAN is a bright, almost neon, teal polish packed with all sorts of color shifting goodness. There is a strong copper to gold shifting shimmer as well as color shifting metallic flakies to pay tribute to all of Derek Zoolander’s “looks.” Yes, we could not have a Zoolander inspired polish without a nod to Blue Steel. The flakies shift from blue, violet purple, to aqua. I really love the speckled look of the polish. We had originally planned to add some holographic pigment but decided against it to allow the base color to be as bright as possible and to allow the shimmer and flakies to stand out. 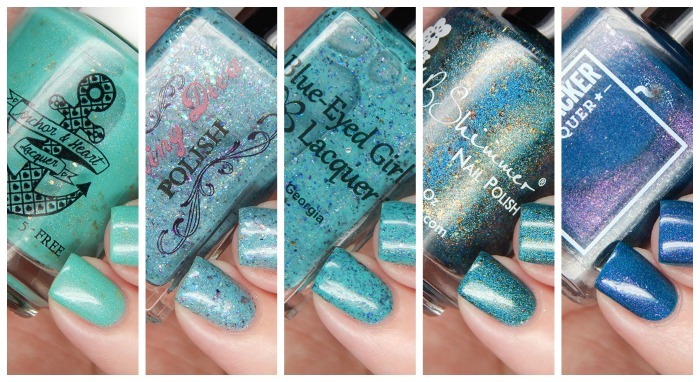 Despite being so packed with shimmer and flakies Merman, Pops, MerMAN applies smoothly to the nail. The only application note I want to give is to be careful not to overwork the polish because it will pull up the flakies, especially after you apply the first coat. The flakies spread out evenly on the nail without much manipulation and you get a lot of flakies on the brush to provide a nice amount of that color shifting effect. I found the color shift of the shimmer and flakies to be most visible in bright light or sunlight but I also noticed it at various points through the time I wore it. Because the polish contains flakies instead of glitter it remove easily but you will want to be careful of transfer of the flakies onto the skin around your nails. I truly love this polish and I think Julie did a fantastic job that was both representative of our theme but also was accurate to a teal polish that represented me as well. I’m a big fan of bright colors, shimmer, and color shifting elements whether its thermals, solars, or multichromes. I could not be more thrilled with the final result and I hope everyone will enjoy it as much as I have. Once the other bloggers have had a chance to reveal their polishes I will be sharing the rest of them with you in a full review of all the polishes that will be in the teal edition of The Color Box. Spoiler alert, all of them did a fantastic job. The teal edition of The Color Box will be available for preorder starting June 27. If you are eager to learn more you can join The Color Box’s Facebook group. I will have more details in my full review of the all the teal polishes once the other bloggers have unveiled their polishes.